The beats jump back and forth between great and subpar, but Monch's lines are as great as ever. Pharoahe Monch’s time between albums is rage inducing. Each Organized Konfusion album had a down time of three years before the next one, but the eight-year break between Internal Affairs and Desire was maddening. 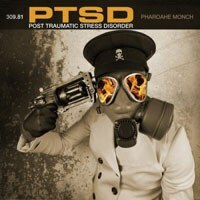 Monch is finally back to a fairly regular release schedule, which makes sense as PTSD: Post Traumatic Stress Disorder acts as a brother to Monch’s 2011 album WAR. The acronyms, gas mask album covers, and Monch’s continued socially conscious flows tie the albums together. PTSD weaves many stories together; drug addiction, government surveillance, and gang violence are the themes of choice. This isn’t anything new for Monch, but he’s trying to mix it all together as a concept album and it doesn’t always work. The problem is never Monch’s lines (legendary and impressive as ever), but the album’s structure collapses under its own weight thanks to questionable production and a plot that never becomes cohesive. Still, Monch’s bars are among the best in the game. Put his words over shoestring production and your jaw would still drop. The complaints on the production side come from the tracks that try to infuse rock into the background. Monch is best over boom-bap and soulful sounds, but he still holds well over some eyebrow raising beats. Monch handles his own production on “Heroin Addict”, which clearly wants to plant Jimi Hendrix’s DNA into the track. It makes sense since PTSD deals with mental illness and the opening guitar riff sounds like “Manic Depression". Unfortunately, it ends up less “Purple Haze” and more Lenny Kravitz. Similarly the seemingly random guitar scratches on “Scream” add nothing to the track. That song also holds the most cringe worthy chorus on the album and some of the few weak verses that Monch has done. This is a 17-track album, but the track list is misleading. Five tracks here clock in at around or under a minute and only act as glue to hold the story together. Even then they seem shoehorned in. A robotic voice advises Monch on the intro, “Wake Up", and the outro. The only skit that really works is “SideFX” which pokes fun at pharmaceutical companies peddling drugs with dangerous side effects. On “PTSD” Monch does let some light shine in. “When your cerebral ceases to administer silence / And the only faith you have left is a CD,” he raps just after the chorus comes in. “Sure as kingdoms rise the same kingdoms were sure to fall… as if weren't there at all / Like broken limbs of trees that's lost its leaves to Winter's wind / Spring will come again.” It’s a gorgeous sentiment hidden in an album cloaked in choking darkness.